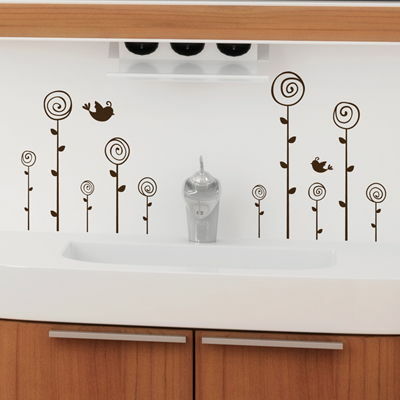 Start your very own mini garden with these adorable Mini Poppy wall decals! Poppies vary in size from .7 - 1.6 inches wide by 3.2 - 10.8 inches tall. If you need a custom size, just contact us! We can customize any of our wall decals according to your specifications. Available in any one of our colors! This set of 10 Mini Swirling Poppies come separately so you can place them however you choose! These decals ROCK. I absolutely LOVE them - they totally transformed my room. I'm serious! TOTALLY! I bought this and never regretted it! It is beautifully made and by far the perfect centerpiece for my home. I just completed a large project for a church nursery. I ordered decals from three different companies, but Dali Decals were my hands-down favorite. They stick well and look amazing. The staff was easy to work with and helped me to customize decals that fit perfectly for our space. Thank you! I love my inspirational quote decal! It\'s on the wall in my bathroom. It was pretty easy to put up. Although I admit I did try to make rocket science out of getting it perfectly straight. But I knew once it was up it was there to stay so I wanted to get it right. In hindsight I should have spaced each line a little closer. But I didn\'t realize that until I peeled the paper backing off. Not a big deal. I\'m still very happy with the end result. I chose dark grey matte to go against a pale blue wall. I\'m glad I did. It reminds me of the color of pencil lead, which looks nice in the script font. I like it. !